Hello, people! 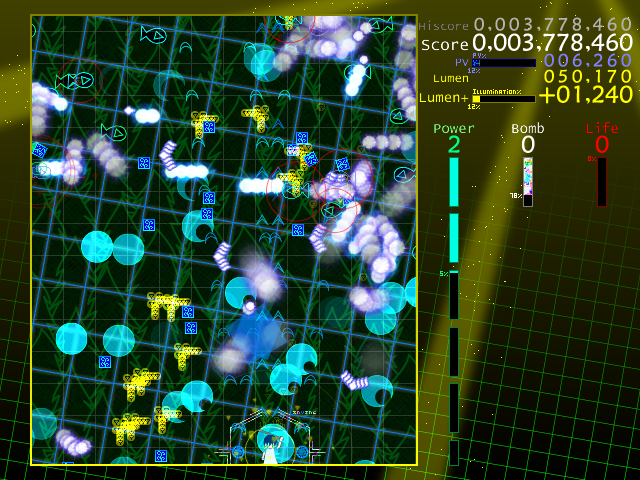 Incomprehensible Luminescence Alpha release 2 is now available for download on the downloads page. Release 2 adds a lot of menu content, fancy bomb effects for Indris, and an expanded Burgeon stage in four difficulties, as well as many other tweaks and additions. I.L. currently loops the stage infinitely but no longer drops extra lives for the player, in order to increase the challenge of the gameplay. Controls are identical to Touhou’s controls: hold arrow keys to move, hold [Shift] to focus / show hitbox and lower movement speed, hold [Z] to shoot / make selections in menus, press [X] to bomb / go back in menus, and press [Esc] to pause / unpause. To play the game, unzip the download anywhere and run Inmaku01.exe found in the extracted folder. Have fun! Some users have reported that they are unable to change the game window resolution after checking “Set as default” in the initial window resolution prompt. A temporary workaround is to delete the inm01.cfg file, which can be found in the same folder as Inmaku01.exe. This will reset the window resolution prompt, allowing the user to select a different window resolution. This issue will be addressed and resolved in the next release of I.L. Merry Christmas, everyone! Incomprehensible Luminescence has been released for download! The catch? It’s only an alpha release. Drat. I.L. 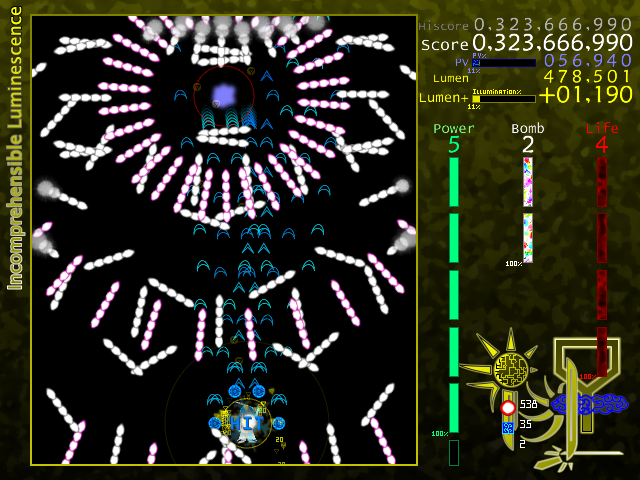 Alpha Dev release 1 features a nearly complete game engine, one playable character, and a bit of challenging danmaku. Use the arrow keys to move, [Shift] to focus (move slower and show the hitbox), [Z] to shoot, [X] to bomb, and [Esc] to pause. You can get the game on the downloads page, or just use this direct link. Just open the ZIP and extract to anywhere. Run Inmaku01.exe to play.